For decades, we’ve been told big fat lies: if you want to lose weight, don’t eat fat. But the latest research shows the opposite may be true. Adding healthy fats to your diet may help prevent overeating, promote better brain function and improve your overall health. 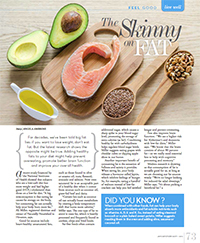 “A big misconception is that eating fat causes fat storage on the body, but consuming fat can actually help your body burn more fat,” says Ali Miller, registered dietitian and owner of Naturally Nourished in Houston. Instead of avoiding fat, focus on eating single ingredient foods and skip the highly refined carbohydrates. A recent study, financed by the National Institutes of Health, showed that those subjects who ate a low carb diet lost more weight and had higher good (HDL) cholesterol than those on a low-fat diet. The key is to eat heart-healthy unsaturated fats, such as those found in olive or sesame oil, almonds, nut butters, flaxseed, avocado and salmon. Coconut oil and grass-fed beef and dairy are good choices of saturated fat, which is now accepted as part of a healthy diet. “Certain fats such as coconut oil can actually boost metabolism by creating a body temperature shift that burns more calories,” says Miller. The one fat to avoid is trans fats, which are heavily processed and frequently found in cookies, chips and fried foods. Eating simple carbohydrates such as sweets causes a sharp spike in your blood sugar level, and the excess sugar is stored as fat. Combining fats with carbohydrates helps regulate your blood sugar level. For example, Miller suggests eating grapes with cheddar cubes or dipping apple slices in nut butter. Fiber-rich complex carbs – such as legumes, vegetables, quinoa and brown rice – take longer to digest, so your blood sugar level rises more slowly. Another important benefit of consuming fat is the sensation of fullness and satiety it gives you. When eating fat, your body releases a hormone called leptin, which inhibits feelings of hunger. So, for example, eating a handful of walnuts instead of low-fat crackers can help you feel satisfied longer and prevent overeating, explains Miller. When combined with other foods, healthy fats can help your body absorb more antioxidants and fat-soluble nutrients such as vitamins A, D, E and K. Instead of eating steamed broccoli or a plain baked sweet potato, Miller suggests roasting them in the oven and adding olive, sesame or coconut oil.